Today is a new TCPTUES challenge and it is Anything Goes! With Thanksgiving around the corner, I couldn't resist making a thankful card using the new release of the Grapevine Wreath die and the freebie set of leaves dies when you spend $65 or more. The look of the wreath was completed with the new Easy Stitched Bow die and some gold chunky glitter scattered throughout. The sentiment is from the Wreath Building Kit set which goes perfectly with the Grapevine die. It is a perfect time to stock up on your favorites as Alma has a sweet deal happening now. 30% off the entire set including the new release!! 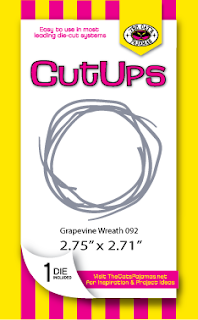 You can't get a better stock up deal and a great way to get those free leaf dies. We hope you play along and link up with us for your chance to win a great TCP gift certificate! Be sure to stop by the Cat Pack blog to see the other fun creations from the pack! Hope you have a great day! That's right- Shut the front door! It's Feature Day today with the DT of Your Next Stamp. Today we are sharing with you some creations in the theme of Christmas. Perfect to get your mojo going for the holidays! For my card I am using the new fun die set called Front Door. Super fun.. you can use this set for a peek-a-boo card so that the recipient can open the door for a surprise or use it like I have as a stationary door. I really wanted a CAS simple card using this door as the door to being home for the holidays. I used some patterned paper from Studio Calico that mimics wood grain in red and popped up the wreath over the window. For a little added color, I did place a small piece of yellow card stock behind the window so it sort of looks like someone is home. 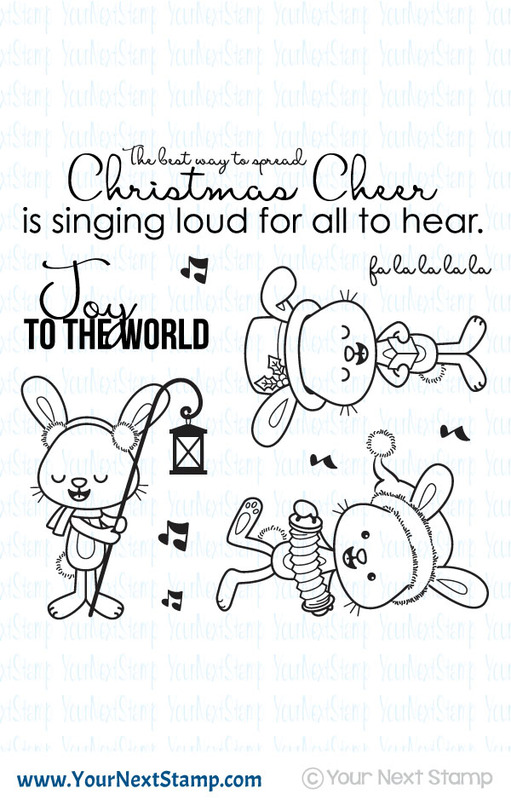 The sentiment is from another new die set this release called Christmas words. All the gold shown, around the edges and on the words, was created using a gold sharpie. For the edges, I used a ruler to ran the sharpie along the edges and just colored in the words once I cut them out. I do like just the hint of gold. To complete the look, I added some Gold Nugget Gumdrops to the wreath. Be sure to stop by the YNS Blog to see all the super cute and super creative Christmas designs made by the team. Thanks so much for stopping by and hope you have a great Sunday! Hello crafty friends and happy Friday! This week is a new Your Next Stamp Challenge that we'd love to see you participate in! 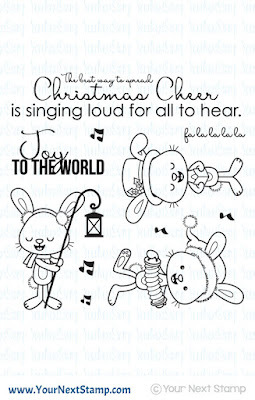 For my card, I created on using the new Winter Mittens and Christmas words die with the new sketch to make this super fun card perfect for the holidays. I started with the Stitched Square die set to create the frame for the top panel. Using the Christmas Words die set, I picked out the 'Happy Holidays' die and cut it on the bottom portion of the square. Taking my craft knife, I hand cut out the center leaving just a frame and the words. I followed the sketch and made the background panel in just a black card stock. For the mittens, I cut them out using patterned paper from Studio Calico to mimic a knitted look and even reversed the die so that I could have a left and right mitten. I added the ric-rack embellishment and some buttons for a more realistic feel. The mittens were complete with some plain red divine twine before being popped up over the black panel. 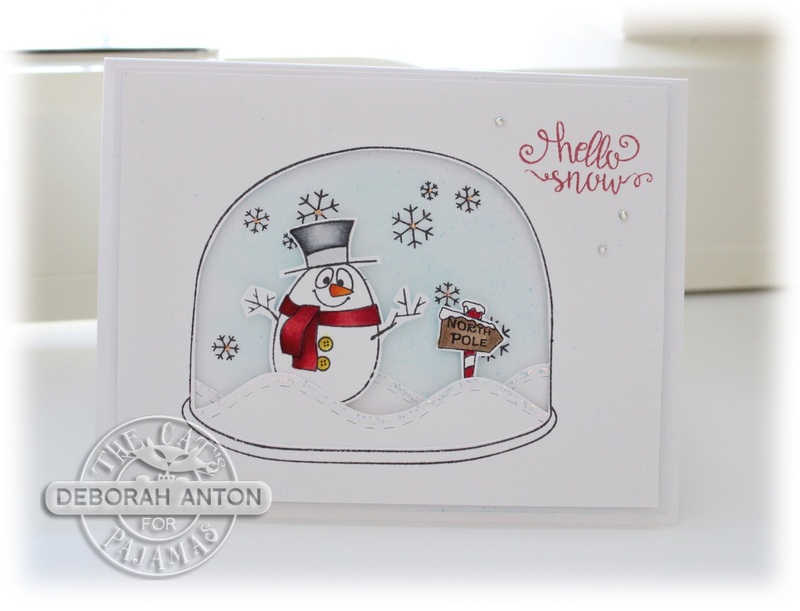 The card was complete by adding some new fun Holly Jolly Gumdrops and a snowflake with some added stickles. Be sure to stop by the YNS Blog to see all the fabulous creations from the design team. Thanks so much for stopping by and hope you all have a great Friday! Welcome to this months TCP new release blog hop!! Hopefully you were able to join us on our Facebook page last night for all the fun and prizes! There was much to be seen and shared. Ok! Let's keep hopping...If you arrived from Nancy's blog, then you are on the right track. If not, be sure to start on Lori's blog to start on all the hopping fun. For my card, I made one using the new set called Bunny Christmas along with the new bow Cut Up. Using some fun patterned paper from MME, I used a strip to begin the background followed by a panel cut out using Framed Up. The image was stamped and colored with Copics before being fussy cut out and popped up. It was complete by adding the bow cut up and some sequins followed by some white dots in the corner using my white gel pen. A great CAS card showing off Bun Bun and his holiday stash!! Now keep hopping along and visit Christine's blog for more eye candy! Thanks for stopping by and have a great day! My card today is a simple and elegant one using the new Bow Cut Ups. This is such a cool Cut Up and one I can see using quite often. Not to mention it is SO easy to use!! I thought I would make this card like a package to create an elegant way to give a holiday card. 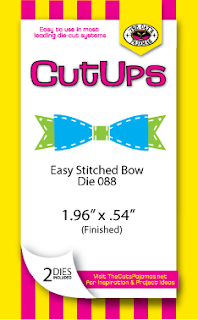 The bow was made from the Cut Up while the strips were made by my and using a Cutter Bee perforated tool to create a similar look to the bow. The tag was created on my own and I stamped the sentiment from another set for the single word. And can I just say it couldn't have been a better time to showcase that sentiment? With all that is happening in the world, Peace is just was we all need. The patterned paper is from Anna Griffin. Now that the whole week has been a spotlight on the new release, tonight is the big night to join in on our Facebook PJ party for fun, games, prizes, and more sneak peeks from the Cat Pack. We hope you have been leaving some love along the way this whole week on the blogs showcased. That way you are IN IT TO WIN IT!! Thanks for stopping by and taking a peek! We hope to see you on our Facebook page tonight! Let's start the weekend with a little pizzazz - some paper pizzazz! That's right... This months DT Dare with Your Next Stamp is all about using 3 or more different patterned paper on our projects. For my card, am using the new set of Ice Skating Phoebe with 4 different patterned papers used in both paper piecing and for the scene itself. How cute is Phoebe? I just had to make her look like she was skating on her own patch of frozen water against some hills of snow. It is a little difficult to see the different heights of the snow, but I have 3 different hills all popped up for some dimension. Phoebe and the trees were colored in with Copics and cut out using the coordinating die set and placed on the snow. The jacket and scarf were paper pieced and the card was completed with some new yummy gumdrops in Ice Ice Baby. Be sure to stop by the YNS blog to see all the fabulous creations from the design team! Thanks for stopping by and taking a peek. Have a great weekend! The weekend has arrived and now you have much more time to take in all the fabulous projects you've seen for The Cat's Pajamas Sneeky Peek week! Not to mention you can add all the fun goodies to your list ready for release day. 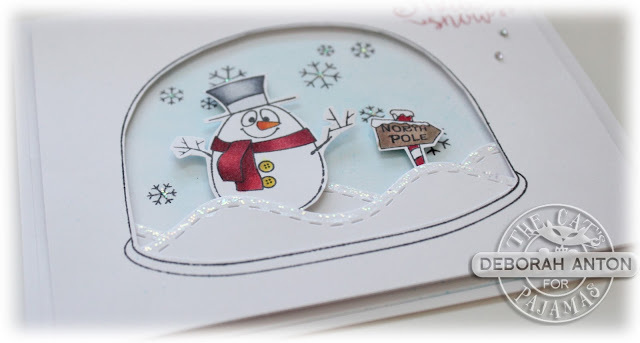 For my card, I am using the new, fun set of Snowman Accessory pack. 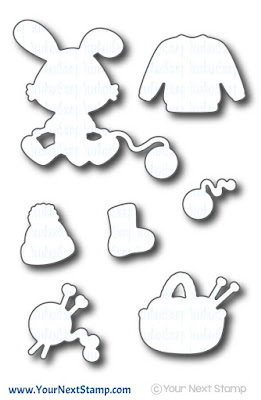 This awesome set allows you to build a snow globe using the the super cute snowman and fun accessories it has. A shaker card is first things that pops into my mind when using a set such as this, but I decided against it for this one. The sentiment was stamped on the front panel which is also popped up and finished with some rhinestones. You don't want to miss out on checking the other Cat Packs' blogs and leaving them a little love! You could be IN IT TO WIN IT! That's right! Just by leaving a comment on each of the Kitty's blogs, you have a chance to win $10 to the TCP store. But the fun doesn't stop there! Join the cat pack on our Facebook page the night of the release and you can win even more prizes while joining in on the fun. Thanks so much for stopping by and peeking at my card! Have a great weekend! Isn't this set just so fun?! For my card, I did a bit of masking to achieve the group look. Once I positioned them how I wanted, the fun really began in "dressing" them up with the expressions and accessories that I felt went along with them. The accessories were colored in with Copics and the bottom snow actually has some Wink of Stella and some stickles for sparkle. Some patterned paper from Studio Calico was added for the background while the main image was matted and placed on top. I completed the look by adding some snowflakes in green punched out with my MS snowflake punch and stamping the sentiment directly onto the paper. The snowflakes were then popped up and finished with a glittered enamel dot. You don't want to miss out on the fun with games, chatter, and prizes! Thanks for stopping by and we will see you in your pajamas! It's day 3 of sneaky peeks with The Cat's Pajamas and the it has been cuteness overload! Today's sneak is a set called Bunny Christmas. So much fun and humor and I can see some Christmas tags being made. 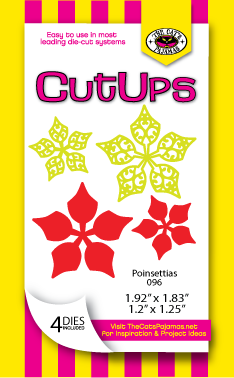 For my card, I added in some new Cut ups being released as well that will add some holiday cheer to your projects. I stamped the image and colored him in with Copics before fussy cutting him out. He is then popped up over the wreath cut up with the sentiment placed at the bottom. For the center panel, I used the frame up cut ups before completing the look with some rhinestones. Have you been following the sneeky peek week with the Kitty Cat pack and leaving a little love along the way? Well then you can be In It to Win It! Leave a comment each day on the sneak peek projects and a random winner can win a $10 gift certificate to the TCP store. But the fun doesn't stop there! Join the cat pack on our Facebook page the night of the release and you can win even more prizes while joining in on the fun. Thanks for stopping by and hope you have a great day! Could this week get any better? New releases are happening and today is the first day of November sneak peeks from the Kitty Cat Pack of The Cat's Pajamas! This release is Ah-door-ah-ble!!! Packed in with cuteness for the season. Not only is it the first day of sneaky peeks, but a new challenge too! I have a project on the bottom of this post for the challenge. Today's sneak from me is a set called First Christmas. This is perfect for your furry loving family and friends and it will surely bring a smile to their faces. Look at the adorable face of the puppy just wanting that kitty to give him a little kiss under the mistletoe! hee heee.. I just love it. I cut out the center of my panel with some circle dies and stitching lines for the outside before layering and popping it over some patterned paper from Lawn Fawn Snow Day.The images were colored in with Copics and fussy cut out to be popped up as well. The sentiment was stamped directly onto the outside panel before a few red sequins finished the look. Stop by the TCP Blog for more fun sneaky peeks from the Cat Pack! You surely don't want to miss out on all the cuteness. Now, are you IN TO WIN IT? Just comment along the way to seeing your sneaks and you could win $10 in Cat Cash for the TCP Store. Next week is the new release and the TCP Facebook PJ Party. Be sure to tune in on our Facebook page to join in on the fun and to win some prizes. We can't wait to see which is your favorite! Now, for the TCPTUES Challenge.... For this card, I am using the Home For All Seasons set to create the scene I made. We hope you will play along with us for the challenge and enter your creation for a chance at winning a gift certificate to the TCP Store! We can't wait to see what you create! Thanks so much for stopping by today and taking a peek! Have a great day! It is release day here at Your Next Stamp and we are inviting you to hop along with us to see all the fun stamp and die sets for the month. There are so many wonderful sets being released this month for the holidays that it is hard to choose which one I wanted to play with and share with you. But I do have two cards to share that I was able to create some fun out of these two different sets. 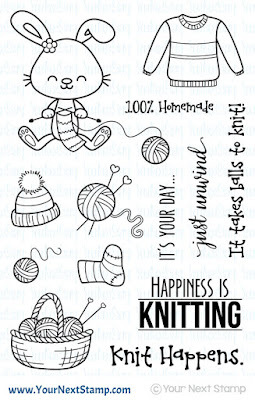 The first set is one called Sprinkles - Knit Happens. 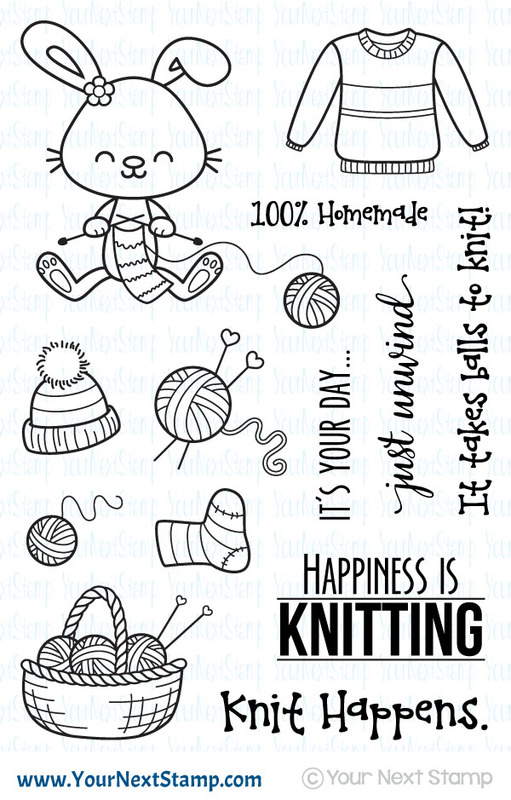 Perfect for that knitter in your life! I used some fun patterned paper from Doodlebug and Co. and some plain kraft paper cut out with the stitched rectangles die set to stamp some of the random knitted items in the set for the back ground. Sprinkles was stamped and colored in with Copics before being cut out with the coordinated die set and popped up over the open scallop die cut out. The sentiment was fishtailed and placed in the center of the card. It was then completed with some latte gumdrops. I was really going for a subdued look on this card with some a subtle pop of color. For my second card, I used the new set called Spreading Christmas Cheer. This is an adorable set and I couldn't help myself in masking this cute group of carolers to achieve the look on the main panel. Once masked and stamped on a stitched circle die cut out, I colored them in with Copics. I used some patterned paper from Bo Bunny which was doubled sided with these fun bingo cards. I layered that underneath the main image and completed the look with some sequins and fun sparkly fluff on their hats and ear muffs. And as usual, Karen has made this release sweeter by adding a fabulous sale to boot! 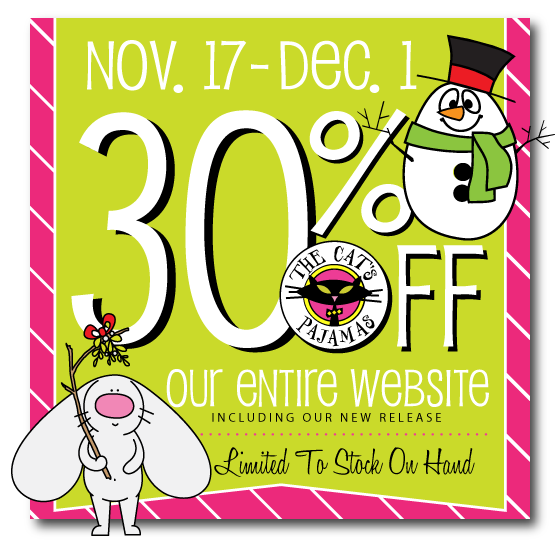 20% off your total purchase! You definitely want to take advantage of that with the long list you have from this release. Don't forget to leave a little love along the way as you hop so that you may enter a chance to win a $25 gift certificate to YNS! The winner will be announced on November 14. Thanks for stopping by and have a great day!